If you’re looking for an adrenaline pumping experience to remember for your last day of freedom, then an off road buggies stag do will be just for you. This thrilling activity is great for laughing, racing and experiencing something new with the guys, making it the perfect outdoorsy stag do for any groom to be who loves getting stuck in! Kick off your stag do day or weekend with these crazy, heavy duty vehicles that are great for slipping and sliding around a muddy track. All of your friends and family can get involved with this stag do activity and you can choose whether to just relax and enjoy the course or create some friendly competition and see if you can beat the rest. Everything you need will be waiting for you, so all you need to worry about is having an awesome time with some friends. 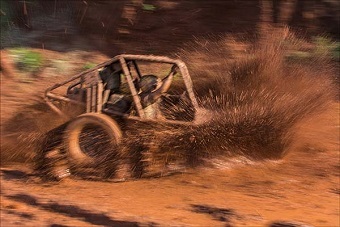 Our courses vary depending on your chosen location, but all provide wet and muddy tracks that will really test your mud buggies driving skills throughout the track so be prepared to get dirty! All of the sessions are tailored to you and your stag group, so if you’re completely new to these exciting vehicles or you’re a total pro at gliding through the mud, your expert instructor will make sure the whole activity is perfect for you on your stag do. The mud buggies stag do activity is a great opportunity to relax and try something new with friends and of course, master the buggies. Have this off road buggies stag do experience completely stress free by letting us do all of the organising for you, just give us a call on 0161 341 0052 and our events planners will do all the hard work for you so all you need to do is turn up and have an amazing time on your stag do!